Invitations to create art bring out children’s natural creativity while providing a low-key activity they can do on their own. 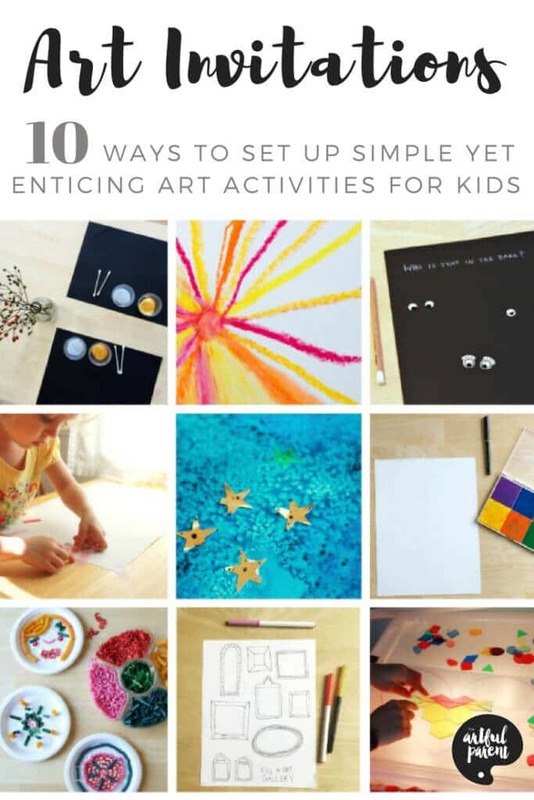 These 10 simple yet enticing kids art activities are set up ahead of time to encourage children to explore art materials, techniques, and ideas. How do you encourage your child to create art? Some kids just seem to want to create all the time. * If they have their own art space, they spend a lot of time there drawing, painting, collaging, sculpting, whatever they are into. If they don’t have a dedicated place for art, they ask for art supplies or activities regularly. *Or so it seems at during phases of their childhood. Some kids don’t, but if “invited” to make art with an enticing set up of art materials, they might happily explore an art activity, material, or technique. Invitations to create are great for all kids—both those who are less likely to make art unprompted and those who seem to never stop. An invitation to create is both an opportunity to entice a child to make art, period, but also an opportunity to introduce a new material, technique, or activity. Art invitations are OBVIOUS and CLEARLY DEFINED, unlike strewing, which is a more ambiguous and subtle way of encouraging learning and creativity. I encourage you to experiment with both. Today’s simple after-school #invitationtocreate … Black construction paper, metallic paint (BioColors), and Q-tips. Use a clean table or otherwise clear space. Have the art invitation set up ahead of time. You can set it up the night before, during nap time, or while the kids are at school. Either set it up directly on the table, or set it up on a tray that you can keep out of the way until you’re ready to offer the art invitation. (We use IKEA trays and the art trays mentioned in this post about art tools. Keep the materials and set up simple and attractive. A single piece of paper with 1-3 different art materials, colors, etc, in small dishes, for example. Allow the child to explore the art invitation in their own way. You can provide some guidance at the very beginning if it seems warranted (for example, “what do you think would happen if you sprinkled some of this salt over the wet watercolors?”) but for the most part let them “own” the invitation. Set out oil pastels, Q-tips, and a small dish of vegetable oil with a piece of sturdy paper. Set up a simple art activity, such as drawing or collage, over a light box or a DIY light table. A stamp pad and a pen are all you need, but a fingerprint art book can provide some fun ideas, too. Print out one of these creativity-inspiring sheets and set out with some markers or whatever is appropriate for the printable in question. Or make one of these simple DIY art prompts. 2-3 shallow dishes of paint, some Q-tips, and paper are all you need for this art activity! A sturdy paper plate, pasta (colored pasta is extra fun!) and some glue allow kids to create collages in any design or image they like, including mandalas. Set out a piece of paper with a hole cut out of it (or something pasted to it) along with a drawing tool or some paints. Sprinkling salt over wet watercolors creates magic! All you need are watercolors (liquid watercolors work especially well), a small dish of salt, and watercolor paper. Add in some foil stars or other stickers for a fun sticker resist. Tape of all kinds is fun to experiment with. Add scissors and paper to a set-up with any kind of tape, but especially try washi tape (printed paper tape) or colored masking tape. Even More Invitations to Create Art! I like the idea to keep the materials simple and easy to work with. Also the idea to only give them a couple of different things to work with. I think back to my childhood and the thing that let me be the most creative was actually only giving me a few options. It seems counter-intuitive, but it worked really well for me. Thanks for sharing! Thank you So Much! I am a retired teacher who still has the itch to teach children! My grandchildren love it when I have crafts or art projects ready for them. We will enjoy your blog and wonderful ideas that will most likely fit for any/all ages! SO I AM PALANNING TO START A CREATIVE SKILLS CLASS FOR KIDS AND YOUR INFORMATION IS THE MAIN SOURCE GIVING ME THE STRUCTURE AND CHANNELISE THE IDEAS AND TOPICS IN AN ORDER. MOST IMPORATANT -I AM ABLE TO LEARN A PLENTY OF NEW THINGS. You’re welcome, Archana! Good luck with your new class! You’re so welcome, Gretchen! Glad you enjoy my blog and ideas! how can i print off some art ideas? I really really enjoy your blog and excellent ideas! !